When moral issues are at stake, it is important to evoke powerful facts of reality showing why a particular moral stand is valid. This is because most environmentalists believe &/or argue that the facts are with them, however poorly they understand those facts. It is counter-productive to proselytize for a large carbon footprint, except perhaps as a humorous opening. No matter how much one insists on his moral right to a large carbon footprint, he will only appear to be an irrationally selfish, moral, curmudgeon, blind to the ‘science’ of Global Warming, & to the long term future of humanity. I am sure that many readers of The New Clarion understand that mankind has a moral and political Right to exploit the Earth, but those Rights, and the positive values they engender are quite abstract. Should one seek to convince others, one must begin with compelling concretes before going to the abstract; it is those facts that prepare an audience to be inclined to listen to abstractions. Thus from fact, moral value can be invoked. Here are four facts that I find serve two terrific purposes. 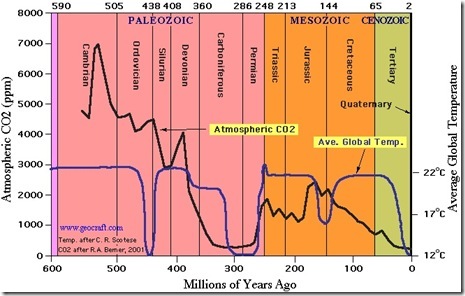 “Did you know that CO2 levels were 100x higher when the dinosaurs lived? Never begin by *saying* you want to produce CO2 to “warm the planet.” Do that, and you immediately surrender to the environmentalist position that human activity affects global climate. It doesn’t. Anthropogenic CO2 is a minuscule portion of atmospheric CO2 (atmCO2). All atmCO2 combined, contributes less than 5% of the Greenhouse Effect —water vapour contributes ~95%. Furthermore, over Geologic Time, atmCO2 has frequently been at 100x more abundant (at ~5000 ppm) than it is today. In the above graph, the blue line shows average global temperatures… it is a wonder we are not in an Ice Age. 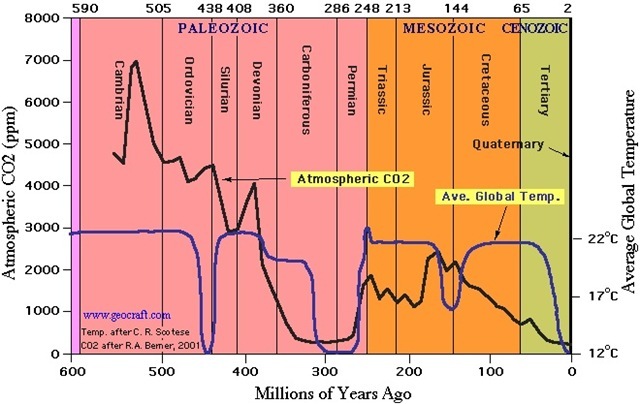 The black line shows CO2 levels, which are shockingly low in the present era. One can readily see that atmCO2 does not drive global temperatures. We can see, that at the end of the Cambrian period, Plants began to evolve from algal ‘scum’. ; atmCO2 began to decline. Yes, those wicked plants consumed CO2, and polluted the Earth’s atmosphere with a deadly oxidizing compound —it rusts cars— and today is known as oxygen. Why? Because plants could make glucose and other carbon compounds, for the wicked purpose of ensuring their own existence. Plants evolved in some 7000 ppm atmCO2, as compared to today’s piddling 400 ppm atmCO2! Plants are begging for CO2. Over the last 60 yrs atmCO2 has risen from ~300 ppm to ~400 ppm —an increase of 1 percent —a piddling amount that environmentalists believe is enough to justify wrecking the world economy, and to force you to drive a Prius. Besides that absurdity, one should realize that atmCO2 is so scarce, at ~0.04%, that for most plants it is a limiting nutrient. Sherwood Idso demonstrated this by growing fruit trees in matching enclosures. The Treatment enclosure was kept at ~0.07 %- 0.08% atmCO2 (i.e. twice the Control levels). The biomass and fruit production of the Treatment trees doubled! …Plants grew better, and food would be cheaper. atmCO2 is so limiting that there are not one, but two, evolutionary advances in the botanical world that specifically improve the botanical capture of scarce atmCO2: C4 plants & CAM plants. These plants have evolved intermediary compounds that capture and store atmCO2 in the damp cool of night, so they can keep their pores closed during the dryness of day, whilst still using their captured CO2 to produce glucose by photosynthesis. The more atmCO2 on Earth, the more ordinary (C3) plants can partially close their stomata during the day , enabling them to retain water, whilst still getting CO2. Thus, if atmCO2 were ten times higher, C3 plants in near desert conditions are more likely to survive … the Earth will be greener. Calcium carbonate is the main mineral material of coral, of shellfish ‘shells’, and of skeletal structures in a variety of plankton. Every year, millions of tonnes of dead plankton bodies drift to the ocean bottom, carrying atmCO2… as sedimentation. What the environmentalists/anthropogenic global warmers do not tell us, and do not use in their climate computer models, is that it is those sediments that form the Sedimentary rocks and Metamorphic rocks of the World. Metamorphic rocks are just Sedimentary rocks hardened under great pressure. Be they the rocks of the Rocky Mountains, the Andes, the Alps, the Himalayas or the (sedimentary) Chalk Cliffs of Dover —the latter being Calcium carbonate in remarkably pure form. … all a geologic functions of atmCO2, of other sediments, and of pressure. They indicate how enormously atmCO2 has been sequestered in rock by biological organisms. Consider, mountains have been built in large part, from atmCO2! The AGWers are, well, ridiculous. Plate tectonics, refers to the movement of large portions of the Earth’s crust, as it floats on the hot inner mantle. Much of the ocean floor, with its sediments, do not hump up to form mountain ranges. Instead, those plates, loaded with calcium carbonate, dive under the continents, in what are called Subduction Zones. Yes, the calcium carbonate sediments are carried into the mantle … the CO2 is gone forever, unless it finds its way back out by a volcano. One thousand years ago, hidden from the modern public’s view, by the Gorons, was The Medieval Warm Period (MWP). The MWP was well known in the late 1960s, and was taught as a period when the Vikings discovered the Americas. They grew wheat on Greenland and sought to establish colonies on Newfoundland. Though the Vikings were not the cultural advancement of “the Virginians”, they were frozen out. The MWP ended. The MWP was much warmer than our present warm period. Scotland had vineyards, because its climate was as warm as that of Southern France today. In the late 1970s, the MWP was well known. Its negative relevance to the Anthropogenic Global Warmers was not merely ignored, it was determinedly written out of geologic history for the environmental , political, career, and financial interests of a few welfare scientists. Thirty years ago (1980), the entire notion of anthropogenic global warming was actually ridiculous. One should be very careful when one is asked to sacrifice for some cause ‘greater than oneself’ because, as Ayn Rand pointed out, there will always be others eager to collect! The collectors could be such “welfare scientists” as Phil Jones (U of Arcadia), Michael Mann (Penn State U), & James Hansen (NASA), who collaborated in manipulating temperature data to hide the MWP, and to exclude temperature records that did not support Global Warming. These three men even indicated, to the World, that they each worked with separately acquired data sets, when they were actually collaborating on a single highly ‘massaged’ data set. They even knew when their programmers instituted calculations that masked NON-warming data, such as the MWP. Similarly, Stephen Schneider (Stanford U.) promoted his career by fear mongering that that the pollutants of human industry would cause an Ice Age, but he quickly switched his predictions a few years later. His “Ice Age” pleas reached High School students across the U.S. and Canada; yet ten years later, He and most of those students argued Global Warming would be our catastrophic future. What these ‘scientists’, and the politicians who engage them, gain from the support of Chicken Little, is an unjust assurance of their academic prestige and scientific funding. Men like Al Gore and David Suzuki seek political fame and wealth. However, they harbour a greater evil. They hate and resent all human actions that demonstrate human ability. The Gores and Suzukis, intimidated by superior minds, direct their intellectual efforts to drag down the good (Julian Simon, Ayn Rand, John Locke) , just as vandals wield sledge hammers to wreck a Lamborghini, though none could build one. All are quite happy to sacrifice billions & billions of taxpayer dollars to themselves, and to their ’cause’, regardless of Truth. Most importantly, they are happy to seek the use of government force to compel other men to join in with the sacrificing. Let us hope it is quite dead. Now reasonable minds must fight the notion that mankind is overusing freshwater, or is overusing plastics… on the grounds that either resource is in a crisis shortage or is an affront to Nature. NO, water & plastic have always required effort to produce & direct, and there has been no change in that respect. Mankind should build nuclear plants to electrolyze water, be it salty or bacterial, and should pump it to where it is needed, by billions of litres. Men should build fission or fusion plants to produce electricity on a scale that a million windmills, solar panels, gas or coal plants cannot match. Energy is the ‘stuff’ of every organisms’ life. Mankind should have it. Every organism seeks novel ways to acquire energy. Humans are no different, reliance on Nature to freely provide energy (or water, or plastic) presumes a fools paradise. Well I haven’t seen conclusive proof of even that much. Here is an example of a leftist who claims that there is a grave threat posed by ocean acidification. This guy posts frequently at NoodleFood and he always defends government intervention with empiricist arguments. He is the type of environmentalist that is going to throw a thousand studies at you. In order to combat leftists like this I think we are going to need scientific arguments of our own but of course in the end philosophy trumps science. Inspector, thank you for highlighting “Human reliance on Nature presumes a fools paradise.” At the time, it did not strike me as a significant wording, I was just calling a spade a spade. I was too caught up in the insanity of Environmentalism to realize its contextual value; now I am pleased about it. If my post provided compelling facts, please let me know via the comments, and let me know which. I am interested in what this audience knows.